The days are getting longer and we are getting farther into the Crime Fiction Alphabet meme. If you are unfamiliar with CFA, it is a challenge run by Kerrie over at Mysteries in Paradise, so head on there and sign up, or click on some links and read what others have to say. This is my second time at this dance off and I have chosen to focus on topics related to crime fiction rather than books and/or authors. “DNA leads to arrest in 20-year old double murder!” screams the headline, and we know that we can rest safely tonight thanks to the men and women behind DNA and the DNA test. Everyone has heard about DNA and we all know that each person’s DNA is unique (except in the case of identical twins). Most of us know that the DNA strand has a double helix shape and some even know that it is made up of bonds between pairs of nucleotides. But, what exactly is DNA testing and what do all those lines and squiggles mean? The first thing to realize is that a DNA test doesn’t compare your entire DNA to another DNA. Mapping the order of every nucleotide in DNA, referred to as Genomic Sequencing, is an enormous undertaking and pretty wasteful, since we share 99.9% of our DNA anyway. Instead, DNA testing isolates certain short repeated sequences in the DNA, called Short Tandem Repeats or STRs that are different across the population. Each STR, also called a Marker, has a certain sequence that is repeated where the number of repeats are highly variable across the population but similar within related individuals. For example, one person’s sequence may look like so “GATAGATAGATAGATA.” If you notice carefully, you will see that in this sequence “GATA” is repeated 4 times. For another person, this marker may have 8 repetitions of “GATA” instead of 4 and so on. However, one marker is still not enough to distinguish between two individuals since the chances are still high that any two people could have the same number of repeats within a marker. So, DNA profiling uses a combination of different markers to narrow the possibilities down considerably. The number of markers used varies by country. In the U.S. 13 markers are used to during testing. DNA profiling can be used for a variety of purposes including identifying victims, paternity tests, and tracing one’s genealogy. The process remains the same though the interpretation changes especially when tracing one’s genealogy since the differences between two strands increases as you move farther up the genetic tree. There is also a lot more to the analysis including a process called PCR (Polymerase Chain Reaction) which is a way of replicating specific portions of a DNA. PCR is obviously very important because it allows the forensic experts to work with the tiniest of DNA samples by using PCR to replicate that tiny bit into an amount sufficient to test on. Finally, some recent work by an Israeli scientist has shown that it is possible to generate fake DNA evidence (including saliva and blood samples) using the information about marker information found in a DNA database. The good news is that they have also created a test that can be used to determine if the DNA has been artificially generated. The bad news is that it is unknown if this test is being used in the wider community. Chances are slim since actual cases involving manufactured DNA are not known at this time. However, it will make an interesting plot device for a future crime novel. 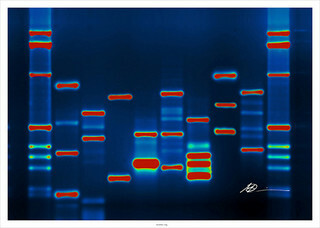 So what do all those lines and squiggles mean on a DNA profile (like in the picture in this post)? It is the output of an automatic DNA sequencer and indicates the presence of various marker lengths. A person’s profile is displayed in one column (or row) and that of the others are displayed in the adjacent columns (or rows), making it easy to create a visual representation that shows how two profiles match. The two extreme columns are called reference ladders and are used, as the name suggests, to provide a way to see interpret the results. A band in the reference ladder refers to a particular length. They usually start at the bottom, so you as you move up the ladder, you would considering sequences of length 2, 3, 4 etc. If the sample has a band that corresponds to the 4 on the reference ladder, it means that the sample has 4 repeats. You could very well represent a DNA profile as numbers in a table, but that doesn’t look as good on T. V. which is why you probably won’ t see it on CSI anytime soon. Peter – I give you much credit for addressing this topic, and you did in such a readable way. I’m impressed. It’s important tor crime writers to have an understanding of what DNA profiling is I think. Not necessarily in-depth scientific knowledge, but enough that they can make their characters and sequence of events believable. Very technical and very interesting, as far as I could follow it. The information about faking DNA is interesting. I will expect to see that in some TV shows soon. Thanks for this overview. My experiences at work with DNA testing have generally not involved in crime. It has become the definitive means of determining paternity. There is no doubt on the identity of the parents. Technology has brought us quite far in this area.